When the sun's not shining, get a yellow umbrella and pretend it is. But then it's at this point where even a cute polka-dotted umbrella in the most cheery shade of yellow isn't even cutting it anymore. You know I do actually have a yellow umbrella. LOL. And I know I've said it a billion times that I love having cooler weather because it gets easier to don clothes that I like (girl loves her some layers!)... but the rain has just been so insane the whole week that I just don't even want to dress up anymore. Don't hate me? It's just that the Manila commuting situation/scene + a tropical storm isn't the best combination for a fashionista commuter (hello Ana!). Some days, I just want something extremely cozy. And I wish I always had a car to go around (and gas wasn't expensive!) If I had those then it'd be so much easier. But we can't have everything now, can we? 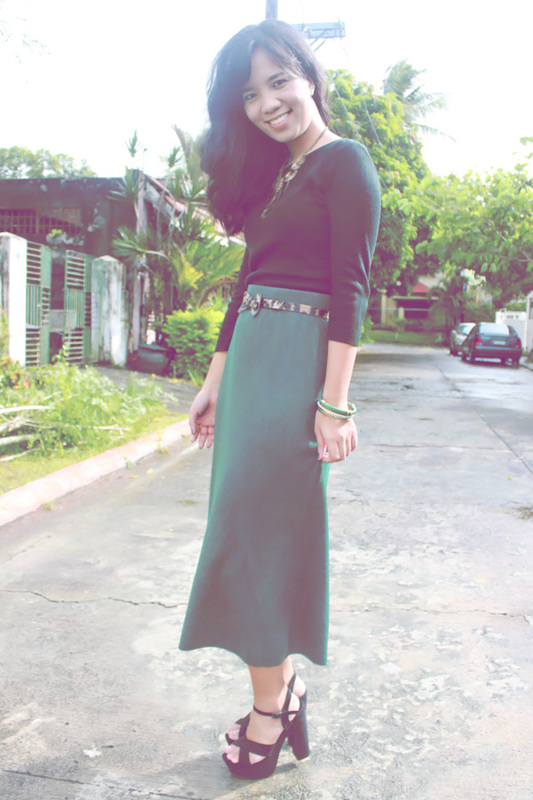 In this case, I opted for a thick long skirt and a quarter-length sleeved top. These are just basics that are perfect for the weather, but are too plain on their own. So knowing me, you can never have enough accessories! Well, okay, you can have enough... I kept it minimal because I was going to commute and so these go inside my bag during the time that I am on the road, so I didn't want to have to lug around so many. Manila has been through a crazy ride with the typhoon, 'Gener', and I do hope you are all dry and safe. I know a lot of families are affected by the situation, and the horrors of our memories from typhoon, 'Ondoy' are creeping up again. I pray for everyone's safety and for those who have lost their loved ones to nature's roar. Hope the weather is agreeing with you at your end of the world! P.S. I'm from London, great blog!